Weekend Kits Blog: Beginner Painting Art Kits - Learn to Paint! Beginner Painting Art Kits - Learn to Paint! If you're interested in learning to paint, but not sure how to get started, you'll want to visit the Paint & Draw Art Kits section of the store. 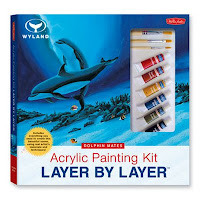 We've added a new selection of beginner painting kits from Walter Foster. These complete art kits include everything you need to get started painting with acrylics, oils, and watercolors! 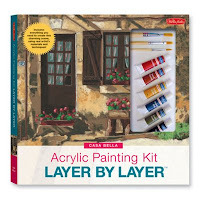 The Layer-by-Layer Acrylic Painting Kit is ideal for beginners to learn to paint a work of art using acrylics! This kit includes a 9" x 12" canvas board that's pre-printed with basic outlines of the scene. A full-color instruction book shows each stage of the painting process as a separate layer, making it easy to see what you need to paint during each step. This acrylic paint kit includes all of the beginner art supplies you need to complete your painting, including 8 tubes of acrylic paint, 3 paintbrushes, a mixing palette, and a plastic palette knife. Choose your favorite scene and get started painting with acrylics! 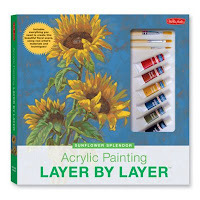 The Beginner Oil Painting Kit includes all of the essentials you need, including a project book, 8 tubes of oil paint, flat paintbrush, round paintbrush, plastic paint palette, palette knife, canvas paper, canvas board, and linseed oil. 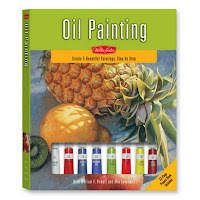 The full-color project book teaches the basics of oil painting and guides you through 5 step-by-step lessons with easy instructions & detailed illustrations throughout. For additional information on painting with oils, see the wikiHow manual on How to Oil Paint, including 11 basic steps and helpful tips for painting with oils. Learn to paint Chinese Brush Animals with watercolors! This complete beginner art kit includes a 32-page project book, ink stick, ink stone, brush rest, 3 Chinese paintbrushes, ceramic palette, 8 watercolor paints, and watercolor paper. The project book covers basics, including handling the brush, color mixing, and brushstrokes. 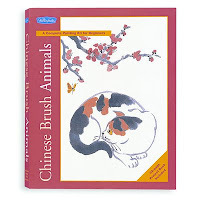 You'll be guided through 11 Chinese brush painting lessons with step-by-step instruction and helpful illustrations throughout. Weekend Kits offers creative project kits across a variety of craft kit categories. Our goal is to make learning a new skill easy and fun. Learning to paint is easy with kits that bring together all of the tools, supplies, and instruction you need to get started with confidence! Visit the Paint & Draw Art Kits to see our complete collection of beginner art kits and get ready to learn to paint on your next Weekend at Home!